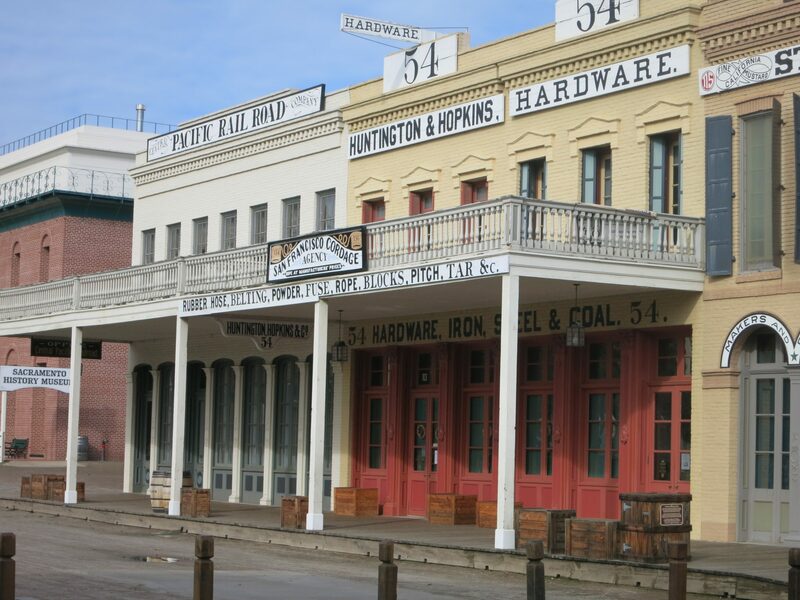 These buildings in Old Sacramento are part of a museum. You get the idea. We visited a place like this yesterday – minus the prostitutes or drunken cowboys. 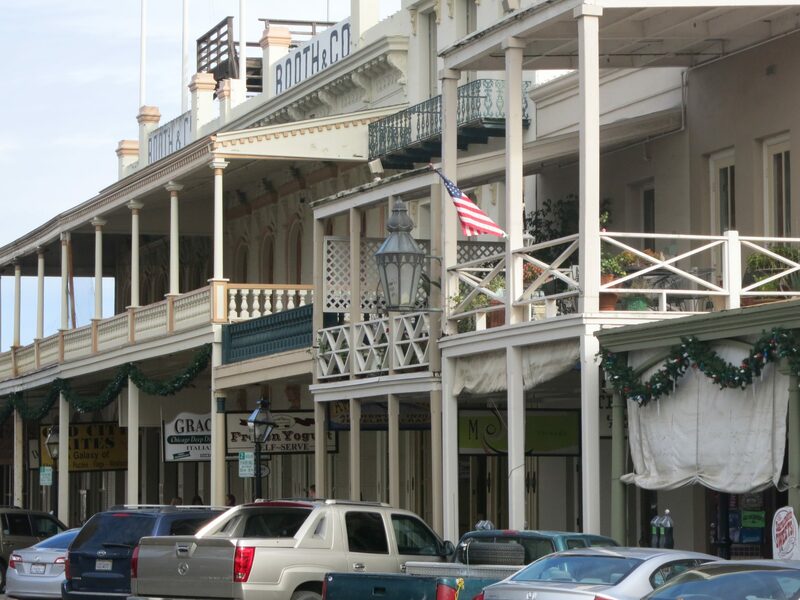 An eight-block section of Sacramento, California’s capital, has been restored to look as it did at the height of the Gold Rush, when it was a starting point for many gold prospectors. Okay, we did spot a few cowboy-like characters, but I don’t think they were drunk. My daughter and I were on our way to visit friends when we stopped there. Nowadays it’s mostly gift and sweet shops for tourists, but we enjoyed a stroll along the wooden sidewalks to drink in the atmosphere. We couldn’t stay long, but if you had the time, it would be worth visiting the museums as well: the history museum, the railway museum, and the military museum could fill a whole day. 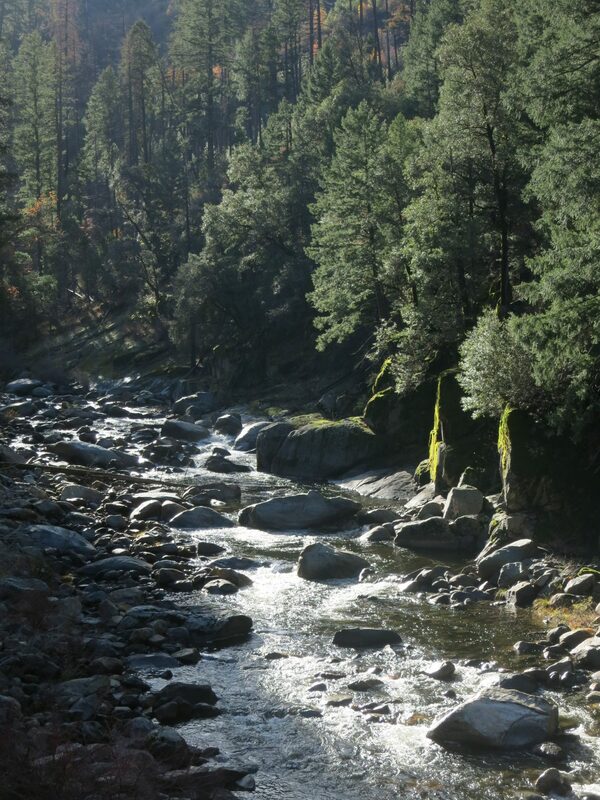 Our next stop was Placerville, further up in the foothills of the Sierra. 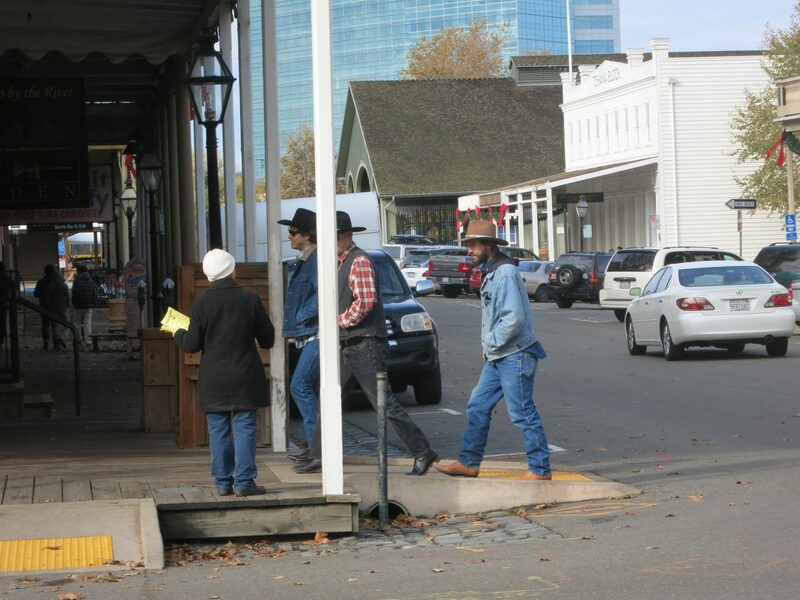 A historic gold-mining town, Placerville is scruffier-looking than Old Sacramento, but distinctly more authentic, in that the shops cater to locals as well as tourists. 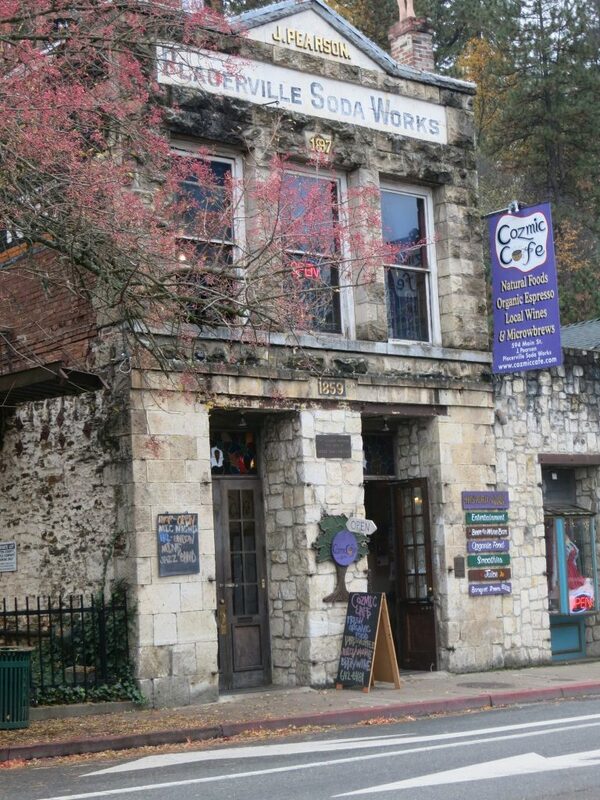 The Cozmic Café is a pub / restaurant / art center / performance venue / historic mine entrance! Our friends pointed out Placerville Hardware store, for example, which is crammed with just about anything you could name. “If you can’t find what you’re looking for,” I was told, “just ask. Chances are they’ll have it.” And it was true! 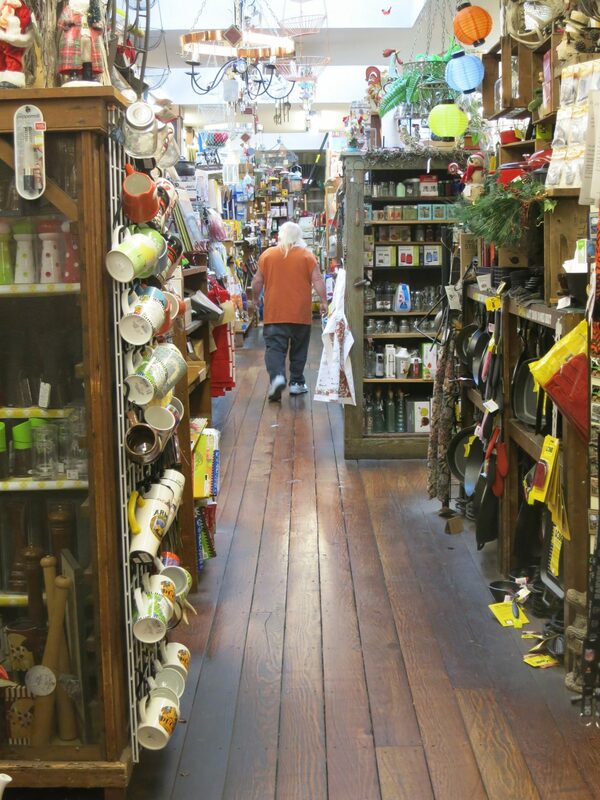 You could spend hours perusing the jam-packed aisles of Placerville Hardware. There are lots of specialty food stores too: a foodie heaven. We visited Dedrick’s Cheese, which offers a delicious selection of cheeses and other gourmet food items. I’ve never seen an olive oil store before, but there was one: at Winterhill I could even taste a range of their flavored oils. There are many more specialty shops we just glimpsed as we shopped for dinner provisions. This morning we left our friends’ place in Placerville to head over to Lake Tahoe for a quick visit. The drive through the mountains is absolutely gorgeous, though if you’re the driver, as I was, you won’t see much of it unless you stop often. The road twists and turns and demands constant alertness. See that road on the left? That’s what we were driving. You can see why it was a bit nerve-wracking! 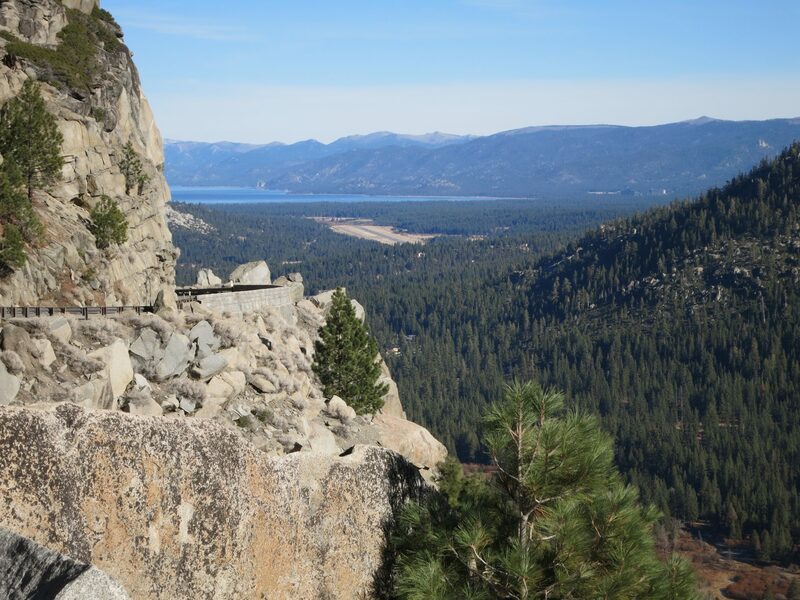 Tahoe is simply gorgeous: a lake surrounded by mountains, already snow-topped in mid-November. Many Californians come here to ski, and we saw many skiers clumping along in their ski boots, carrying skis on their shoulders, on their way to the lifts up the mountain. If you like to gamble, visit the Nevada side. If you like less glitz, stay on the California side. It took a few hours to get back to San Francisco. We stopped at the quirky Red Apple Café for some quintessential American cooking on the way, as well as a couple of farm stands to stock up on gorgeous fresh fruit. This was only an overnight trip, yet we enjoyed this quick glimpse of the other side of the state, if only for the lovely fall scenery along the way. 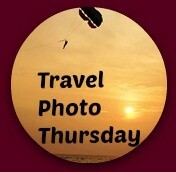 Do you have any special short trips that you would recommend from where you live? Add a comment below! Lake Tahoe is also a wonderful place for a wedding!